The other day I sat down with my new Daisy Delight Bundle, watercolour paper and Pool Party, Bermuda Bay and Cherry Cobbler inks and made a coup of cards. (You can see the other one here). The entire surface of the watercolour paper had a light wash of Pool Party ink followed by Bermuda Bay, concentrating more colour in the lower left corner and blending out. I stamped foliage with Pool Party ink and little daisies with Cherry Cobbler while the wash was still damp - although they didn't blend very much. 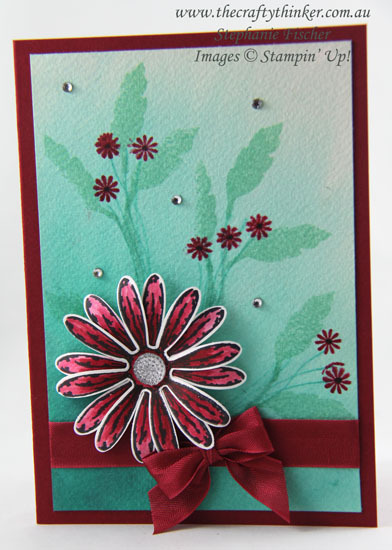 The double layered daisy is stamped with Basic Black ink onto Whisper White card and watercoloured with Cherry Cobbler ink. The centre is one of the gorgeous new Faceted Gems. When the panel was dry, I added the Cherry Cobbler ribbon (I'm sorry to say that it's retired but it was just what I needed!) and adhered it to the Cherry Cobbler base card. As a last minute thing, I added some little Rhinestone Basic Jewels at random on the card.